In everyday life as a high school student in Tokyo, there are many things to consider and our tips for Persona 5 give you valuable help which makes the RPG easier for you. 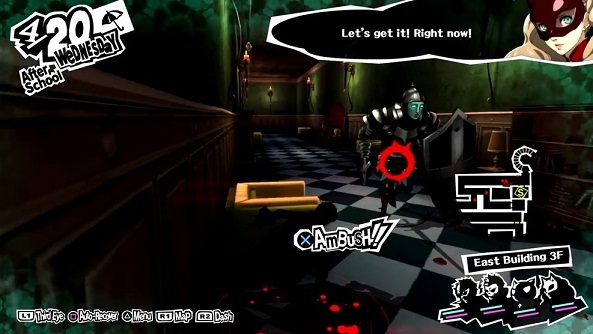 One of the most important tips we can give you is to sparing with your SP in Palace (the dungeons in Persona 5). SP are your skill points and work like mana points in other role-playing games. You will not be fully charged until you leave the Palace. - Don’t hesitate to use your money for medicinal items at the clinic in Yogen-Jaya or in other stores. So you don’t have to waste your SP for healing, but you can use it for campaigning. - Don’t use the Auto-Recover function with a quad-button outside of combat. It consumes precious SP and prevents you from progressing far in a Palace in one day. - Set the tactics of your party members to Conserve SP or Direct Commands. So you have full control over the SP consumption of your companions. - Some items cause damage or status changes in enemies. Also use these often instead of your skills, which cost SP. Lockpicks are infiltration tools that you can craft at the workbench in your room. Within a day, you can create up to two locks at once, which increases your proficiency. With each additional rank, you can then create an infiltration tool per pass. Lockpicks are so important, as you will always find treasure chests in Palaces (Dungeons). While some of them can open without problems, others require a Lockpick. Also, note that Palaces are finally broken after the final boss, and chests that are not open are then lost forever. If you always have enough Lockpicks in advance, you will not have to go back to certain places in the dungeon to open chests. The battles on the way cost you again valuable SP. In the game there should be no day when you go to bed early. Take full advantage of the day, read books, make tools at the workbench or take a relaxing dip in the pool house just around the corner of the Leblanc. Only if you are informed by the game or Morgana explicitly that you need sleep, then it is ok to do so. Anything else is a waste of valuable time in the game because the calendar year advances mercilessly and there are ways that you can use it meaningfully and to improve your social skills. - Try to have as many different people as possible who are strong for different elements or damage types. Because your enemies all have different element weaknesses, to which you can respond better then. - The "Weak" fade will always tell you if a persona is particularly vulnerable to that element. By capturing a persona, you will directly reveal all strengths and weaknesses of this type. In the case of unknown enemies, you must first attack with different damage types and thus find the strengths and weaknesses. - If possible, don’t take any Persona who is vulnerable to Light or Dark because some enemies have attacks of this type that can kill you at once. The load symbol "Take your time", which you see on the lower right of every load screen, is deceptive. Persona 5 is designed so that you cannot create all the activities in one game. You only have one year left in the game and you should concentrate on certain confidants or social talents in the first game, instead of trying to take everything somehow. This also applies to the list of all trophies in Persona 5. In our estimation, it is a thing of impossibility to unlock all trophies in one game play. So you have to bring about all 21 Confidants to rank 10 or maximize all Social Stats maximally. The year has just too few days for it. Therefore: "Take your time" and enjoy Persona 5 over several game runs. In Persona 5, there is a stealth system for the first time. This can be hidden by pressing the X button at corners or behind objects and then attacking patrolling enemies from the background, which is illustrated by the "Ambush" fade. In this way you should always start the fighting. This means that you can always make the first strike in the fight and usually wins after the first moves of your party. The stealth system gives you many mistakes and you can also run from behind on enemies and press X as soon as the insertion is visible. This still applies as a backdrop. However, if you first discover the enemy, they have the first strike and you have to take damage before you can act. In addition, the security level of a Palace is increasing. If you reach this 100%, you are thrown out of the Palace and cannot go back until the next day. This will save you valuable time for other activities. In order to maximize your yield points for your social stats, certain places for activities always visit at the right time. For example, you get more charm (charisma) when you visit the bathhouse in Yongen-Jaya on Mondays or Thursdays, as there are particularly effective medicine baths. In addition, you should learn at the cafe in Shibuya when it rains. Because then you get the maximum yield of knowledge points, since the Cafe has fewer guests and you can learn much more effectively. Almost all places in the game have such special rules and you can always read them in the main menu under System - Tutorials. So plan your day and be as effective as possible. Relationships with your Confidants are very important in Persona 5 and reward you with upgrades with new Skills. What you might not know: You can always find out the location of your confidants. Use the map on your mobile phone and press the square key. This will give you information about the Confidants and where they are. - UP !! Means that you are close to a rank up with a Confidant. - With a blue card, you have already unlocked the Confidant, but still from the next rank rise. - The gray card shows you that you do not have the necessary Social Stats for a conversation with them or have not spoken to them since your first meeting. As you know, time management is one of the most important aspects in Persona 5. We advise you to always have an unread book in your pocket. It sometimes happens that you have some time in the daytime "Early Morning" on the way to school in the train. Here you can read a book and improve your social stats. Sometimes reading books is also the only thing you can do on rainy days or lonely nights. You can always borrow any number of books from the school library. The bookstore in Shibuya has a lot of books on offer that you should buy for few yen.